Nice! I think that's a good way to shake up the flapjacks a bit! Oh man, that looks so fluffy and wonderful! More like "cake" than "pancake". Now I want some pancakes, too. Never had them baked before. That's one I've got to try. Since I am pancake challenged, perhaps I would be good at baking them! 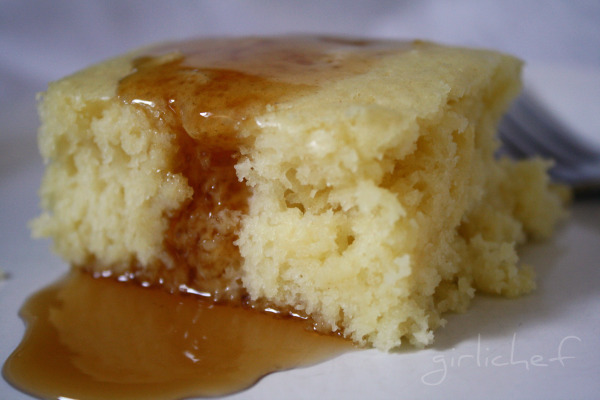 Baked pancakes are a tasty alternative to the stovetop version. I love thin shavings of apple in my oven baked pancakes as well. hmmnn.. this looks like an easy way to cook pancakes..
interesting... I have been having a craving for pancakes as of late... maybe will try these.. it is stawberry season... that sort of sounds good... yum.. I have totally bookmarked this! Looks so awesome! Nice to see you back blogging! Baked and fluffy and light and well, yes - now I have a craving, too! This brings back so many childhood memories for me. My mom used to make this for me and my brothers when we were kids. I like the pancake this baked version...delicious and healthy. Looks so soft and fluffy! Have to try this baked version. yeah I know. Everytime I see them I want them! Looks good and you know what? I've been meaning to try this recipe and I forgot! Thanks for the reminder!